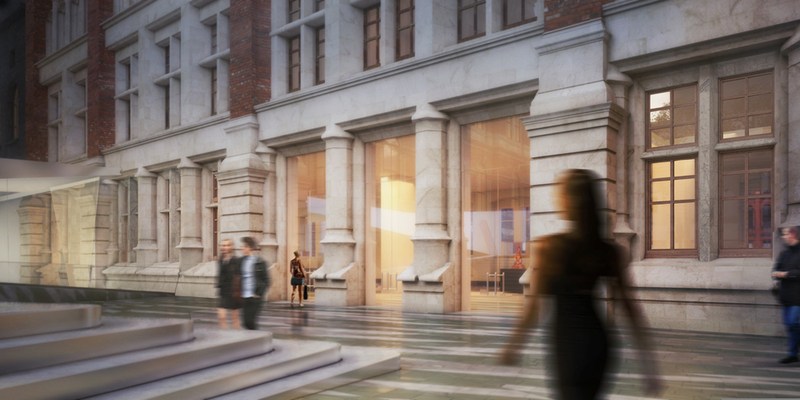 A new purpose-built underground gallery, magnificent courtyard space and a new entrance from Exhibition Road on the west side of the Victoria and Albert Museum are part of a planned £41 million redevelopment of the V & A, one of London's most important cultural institutions. The scheme will transform a previously inaccessible back-of-house space into an open courtyard for installations, events and a cafe, revising the existing screen by Sir Aston Webb - "the most controversial part of the plan" (Financial Times) - the man who designed the museum's main building in 1891. The project will also reveal the beautiful Victorian facades on the west side of the V&A's Grade 1 listed buildings which have been restored but never on public view before. Amanda Levete Architects, AL_A, won the international competition to design the project. Levete who won the Stirling Prize while at Future Systems and has designed stand-out projects such as the Selfridges department store in Birmingham and the media centre at Lord's Cricket Ground. What are the best dining options near V & A Exhibition Road Project London? V & A Exhibition Road Project gyms, sporting activities, health & beauty and fitness. The best pubs near London V & A Exhibition Road Project. V & A Exhibition Road Project clubs, bars, cabaret nights, casinos and interesting nightlife. Where to have your meeting, conference, exhibition, private dining or training course near V & A Exhibition Road Project. From cheap budget accommodation to luxury 5 star suites see our special offers for Victoria and Albert (V & A) Museum hotels, including The Egerton House Hotel London from 81% off.